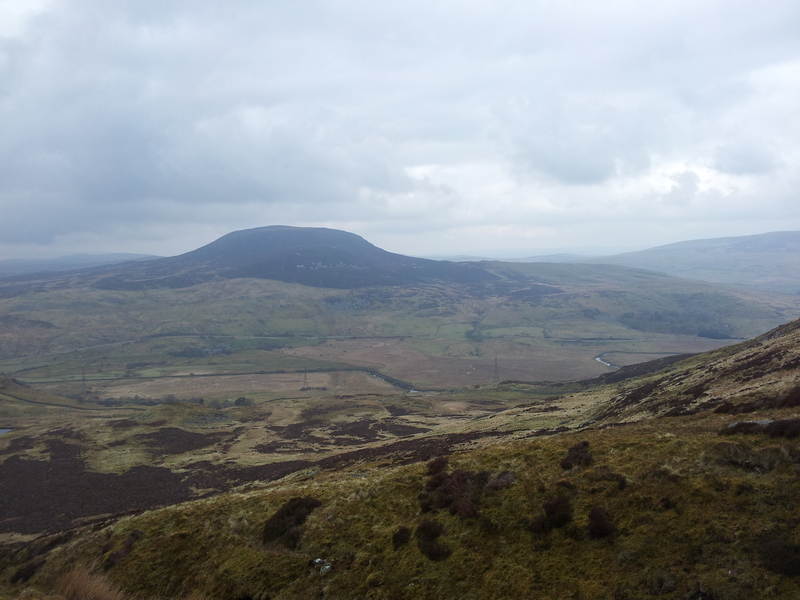 At the end of a surprisingly warm March I met up with five old friends for a weekend in North Wales, beginning with a walk up Arenig Fawr (just northwest of Bala). 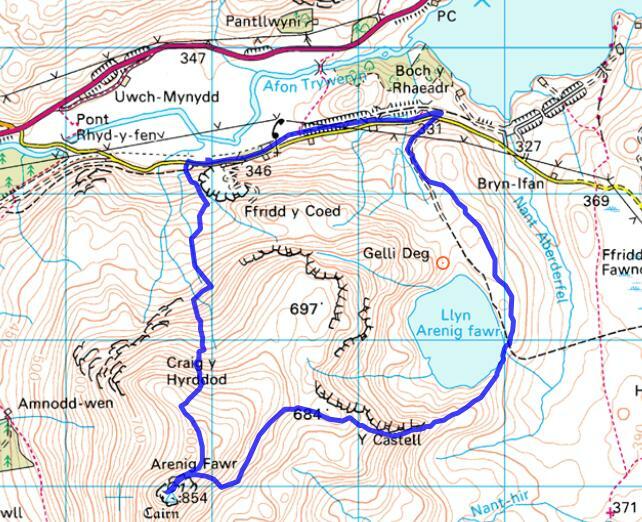 We start from a car-park opposite a quarry on a lane just off the A4212, just west of Llyn Celyn. We follow the lane eastward passing a number of cottages for almost a mile before taking a wide track on the right heading gently up the hillside across open grassland. 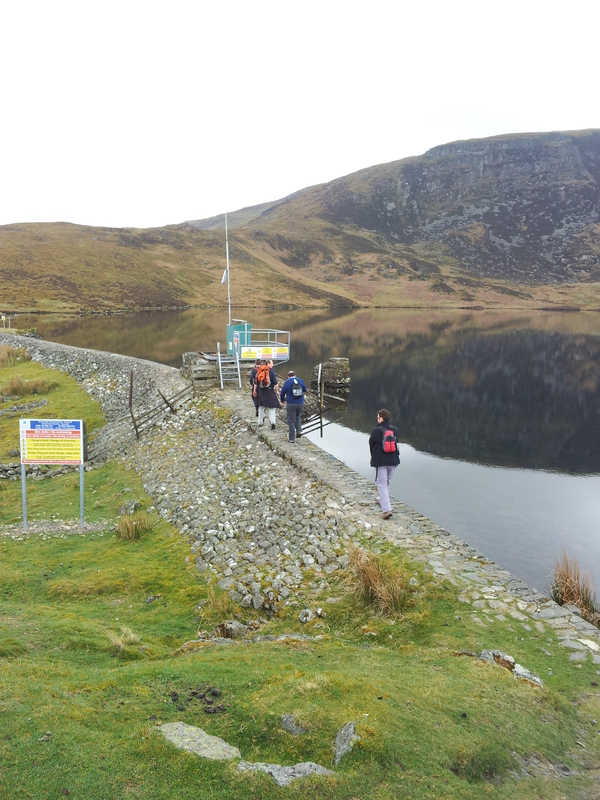 This continues for quite a while until we come to Llyn Arenig Fawr, we leave the path to walk across the top of the dam wall, pausing only to try to persuade Pete to take a dip, but the years have granted him wisdom and he declines. From the lake we start to move up the shoulder of the mountain, the first part is quite gentle, but then, after a brief break we start the steeper, rockier part of the ascent. The fitter among us skip up like goats, but I struggled with high rocky steps, in fact my legs felt slightly jellyish and there were more than a few pauses for breath. The up-side of pausing for breath was, plenty of opportunity to take in the increasingly impressive views over Bala Lake and the Aran range beyond. Eventually I get to the top of this steep section, and I know the worst is over; after we negotiate a fence we lose the track for a little while but soon regain it and for a while the path is green and gently undulating. Suddenly I get cramp in my calf and have to spend a good 5 minutes stretching it out, but after that I’m fine and I get on with the walk as we encounter a few rocky outcrops and small patches of scree. There’s a little more climbing, and I’m relieved to see I’m not the only one to suffer with cramp, eventually though we reach the summit, here there is a small circular wall which shelters us from the wind, and a plaque remembering the crew of a US bomber which crashed into the mountain on its way back to the States after the Second World War, but unfortunately it’s too cloudy to take in the view. We hunker down within the walls for a spot of lunch, we all seem to have brought pork pies of some description, but after a while it becomes too cold and we decide to start the descent, but as we do the cloud clears in the south-west revealing stunning views down the Dyfrdwy valley towards Dolgellau and Cadair Idris. The descent start with a brief walk along a ridge to the north-west, and then a trackless plunge down the spongiest heather covered hillside I’ve ever uncovered, if it weren’t liberally scattered with sharp rocks it would have been immense fun rolling down, but as it was it took all our concentration to avoid twisting an ankle. After a short while Paul, a keen birder, stops us all as he has spotted a number of nesting Golden Plovers, we pause while he counts them and notes the location, taking in the view of Snowdon to the north; then we proceed, taking a circuitous route so as not to disturb the plovers. 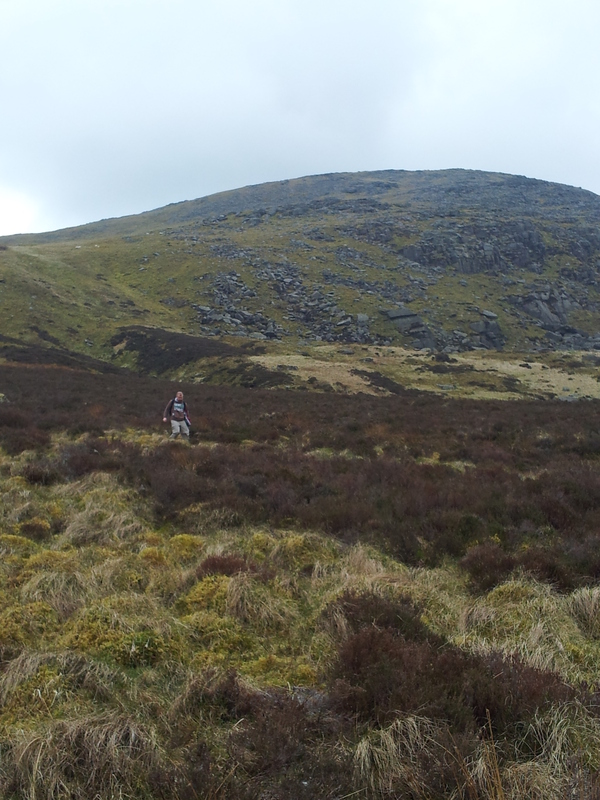 As the descent grows less steep the heather is replaced by long grass, we cross a steep gully and onto boggy land, my legs are feeling pretty heavy by this point but there’s not far to go. We drop down alongside the quarry, back onto rough farm land, and at last to the road, a short distance from the car park. I’m exhausted.